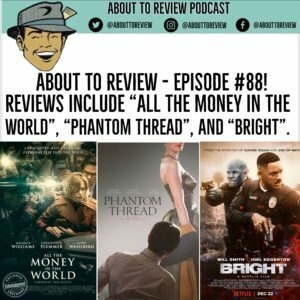 Happy holidays from About To Review! Instead of skipping a week for the holidays, I decided to sit in a room and talk to myself, all because I care about you, my dear listeners! On this week’s episode I reviewed “All The Money in the World”, “Phantom Thread”, and the new Netflix movie “Bright”. Make sure to head over to Facebook and enter the contest for a chance win the new DK book “Justice League: The Ultimate Guide”! Contest details here ➡ Justice League book giveaway! Thank you to all of the listeners, sponsors, supporters, and everyone else who has made this podcast a success in 2017, and I cannot wait to tell you more about what I have planned for 2018!